Internationally known photographer and author Connie Bransilver has been living a most remarkable life. Born and raised in Albuquerque, she earned a B .A. from Duke and a J.D. from the University of New Mexico Law School. She practiced international law in London and served as a Legislative Assistant in the U. S. House of Representatives. During her years in London, Bransilver founded a women’s theatre and the City Women’s Network. Bransilver has also worked as a private banker. Somewhere along the way, she became an award-winning naturalist and photographer who has taken photographs on all seven continents. Her work is held in public and private collections world-wide. Among Bransilver’s distinctions: her photograph was the Grand Prize Winner and conference symbol for the 1995 UN Conference on Women. In 1997, her Chinstrap Penguins on Ice was the Grand Prize Photograph in Explorers Club Magazine. She was the 1999 African Wildlife Foundation Photographer of the Year. Naples groups have recognized this creative individual as well. In 2005, she was the first photographic artist on the Artists’ Studio Tour organized by the Friends of Art at the Naples Art Museum. That same year, the Naples chapter of the American Association of University Women honored her as a “Woman of Achievement.” Not long ago, there was a portfolio of her work was featured in Gulfshore Life. As a nature photographer/conservationist/artist, Connie Bransilver can live anywhere, as long as an airport is nearby. Her work takes her all over the world, but when she is not traveling, Bransilver finds that there is much to discover and expose right here – enough to have inspired her to complete two books on our region. There may be more coming out in the future. Bransilver’s first book, Florida’s Unsung Wilderness: The Swamps (with Larry Richardson) is a mesmerizing, inspiring journey through our neighboring swamplands. It reveals the beauty and variety of this complex ecosystem, photographs and text informing one another. More than a collection of photographs, this book pays homage to a fragile wilderness and movingly argues for its protection and preservation. 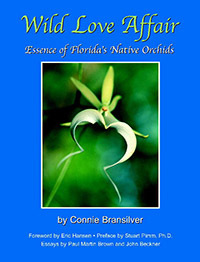 Wild Love Affair: Essence of Florida’s Native Orchids is a magnificent celebration of these captivating and mysterious miracles of nature. Bransilver gives us not only the natural beauty, but the spiritual essence of these alluring blooms, reminding us always of the hold they have on the human imagination. This book, which includes contributions by Paul Martin Brown and John Beckner, stirs our souls and minds on many levels. Both books are from Westcliffe Publishers. South Florida Community College Museum of Florida Art & Culture in Tampa and through a number of other presentations during the winter season. On a different front, she just signed a contract with National Geographic to do a ten minute segment of a half hour show called “Wild Chronicles” that will air on PBS and also on the National Geographic Channel and will be syndicated throughout the world. It will also be available on the web. This project is on the discovery of a new species of lemur in Madagascar. Bransilver is also working, along with five or six other contributors, on a huge and comprehensive book on Madagascar for Conservation International. It will be accompanied by a DVD and website. 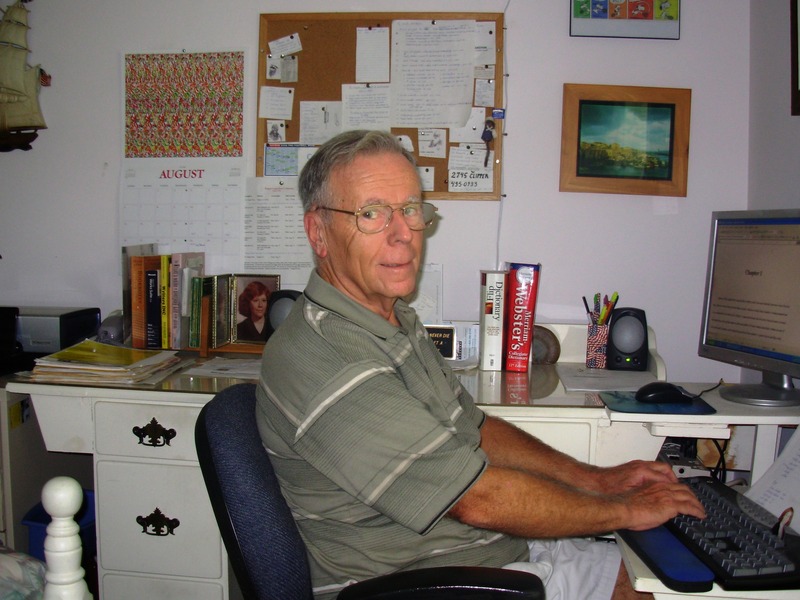 Philip K. Jason, Ph.D., is Professor Emeritus of English from the United States Naval Academy. A poet, critic, and free-lance writer with twenty books to his credit, this “Dr. Phil” chairs the annual Naples Writers’ Conference presented by the Naples Press Club. Send him your book news at pjason@aol.com. He gave up on the first book and threw it away. The second, he held onto and is now revising. The third time is a charm, and so is The Bucket Flower, the riveting first published novel by Donald Robert Wilson. Wilson, a Navy veteran of the last stages of WWII, has been a life-long educator – but first he was a student. He received a B.A., M.A., and Sixth-year Certificate in Education from the University of Connecticut, and he took additional coursework at Central Connecticut State, Bridgewater State, the Massachusetts Maritime Academy, the University of New Hampshire and the University of Singapore. His career as schoolteacher (eighteen years) and principal (twenty-four years) spread over schools in three New England states. A Neapolitan since 1994, Wilson has now turned author – and with astounding results. 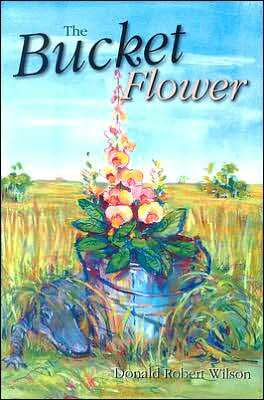 The Bucket Flower, from Pineapple Press, is a skilled and thoroughly engaging effort. No workshops, no writing groups – but plenty of inspiration, hard work, and the loving criticism of two daughters and a proofreading wife. Before he told me, I guessed that Wilson must have taught English and Social Studies. His command of language, structure, and style, and his insight into social and economic classes serve him well in this venture. Like his main character, Wilson has a love of research. And like any successful fiction writer, he can fashion from the discovered facts a fully imagined world into which readers can enter with full confidence and trust. Two years of research, including Wilson’s own first-hand Everglades explorations and copious reading, have paid off handsomely. Young, intelligent, and somewhat rebellious, Elizabeth Sprague could be seen as coddled. The child of an aggressive and somewhat brutish Boston businessman whose wife dreams of acceptance in the highest circles of society, Elizabeth has received a college education; has a proper young lady’s wardrobe, manners, silky hair, and soft skin; and has been insulated from the worst that life has to offer. Or has she? Daring to make a career for herself as a professional woman, she finds her father capable only of belittling her seemingly outlandish and foolish goals. Elizabeth’s timid mother can’t stand up to the overbearing head of the household. A good match and motherhood are all that will satisfy her parents. And the match her father has in mind, at bottom a business deal, is abhorrent to this determined young lady. By the way, this is the 1890s and proper young women do as they’re told. But not Elizabeth Sprague, who has decided to earn a master’s degree in botany by performing trailblazing research in the primeval Florida Everglades – largely unknown territory. A sympathetic aunt gives Elizabeth support, while Mr. Sprague does all he can to undermine his daughter’s efforts – including blocking her access to an inheritance. Elizabeth sets forth on her adventure, and with her the reader travels through Florida at a time when it was mostly a threatening wilderness and a refuge for all kinds of outlaws and other social scum. Elizabeth’s travels are nothing like what we think of as traveling today. Donald Robert Wilson has drawn an attractive central character and a host of menacing villains in this fine first novel. But for this reader, the real hero of the novel is the setting, and the major accomplishment of the author is the splendid, detailed evocation of a gorgeous yet menacing region at a time long before highways, burgeoning residential communities, or even agri-business. This means, of course, that the swampy place – and the creatures that inhabit it – is also the overarching villain. Murky waters, dense thickets, alligators, snakes, mosquitoes, and storms do as much to thwart Elizabeth as do the ruthless members of the human species whom she meets along the way. Often without money and food, and now and again just about without clothing, fair Elizabeth has to dig deep inside to find what strength resides in her essential self. That Donald Robert Wilson, a guy about to turn seventy-nine, can step into the mind and emotions of a young woman living well over a century ago – and do so convincingly – is one of the miracles of what the Romantic poets called the sympathetic imagination. 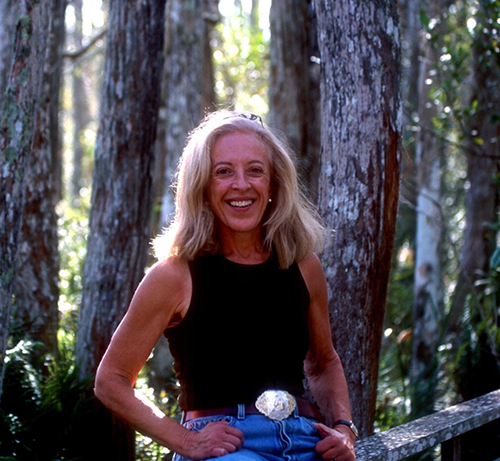 Standing at Elizabeth’s shoulder as she sketches Everglades flora and takes her thesis notes – ears alive to threatening swampland sounds – is an experience every reader will enjoy. Does Elizabeth achieve her goals, survive her encounter with the figure called the Swamp Ape, reconcile with her parents? Reader, I leave it to you to answer these questions for yourself. Wilson’s fascination with the 1890s, one factor that led him to write The Bucket Flower, is the driving force behind his recently-completed manuscript set during the Spanish-American War. The Counterfeit Correspondent is looking for a home, and I hope it finds one soon. Keep in touch with this fine author at donaldrwilson.com. Several years ago, when Marylin Krepf pondered what she could do to perk up her sister-in-law, Phyliss Geller, who had entered a gloomy period following a professional setback, the bright idea of co-editing a poetry anthology popped into her head. Phyliss quickly agreed. Soon after, the Meridian Anthology of Contemporary Poetry was born, with Phyliss taking the title of publisher and editor while Marilyn was designated as literary editor. The latest iteration, Volume IV, has just appeared, and it advances the steady maturation demonstrated through the first three volumes. Marylin and Phyliss have been involved with poetry for a long time. Both were shaped in part by a poetry workshop led by Pearl London at the New School in New York in the mid-1970s. Marylin, as Marylin Butler, published a collection of her work – Half Past Sunset – in 1985. The book received brief but enthusiastic reviews in Library Journal and Publishers Weekly. In that same year, her poem “Listen” was included in the prestigious anthology Carrying the Darkness, edited by W. D. Ehrhart. This is the most influential collection of poems dealing with the Vietnam War. After her marriage to Winfried Krepf, a civil engineer, Marylin followed his career, which took the couple to several fascinating places: Germany (where her husband was born), Saudi Arabia, Siberia, and Indonesia among them. Relocating to the states to establish a more stable, non-wandering lifestyle, Winfried took a job in Fort Myers and seven years ago the couple settled in Naples with their young son. Since the boy’s enrollment at the Royal Palm Academy, Marylin has been named the school’s poet-in-residence. Marylin and Phyliss (who lives in Boca Raton) share in the editorial selection process. Phyliss serves as first reader, logging in the poems and annotating them with her comments before passing them on to Marylin. Marylin then serves as the second reader. She writes to each potential contributor personally, quite frequently making suggestions for revision. Once the poems are selected, the women then strive to create an arrangement through which the poems speak to one another, allowing the anthology volume to be greater than the some of its parts. The present volume and the one before it are notable for including reprints of poems by established poets. Volume Three contains poems by Pulitzer Prize and National Book Award winner Philip Levine. The new volume features poems by Jane Hirschfield. This decision to anchor anthology volumes with a prominent poet allows all the contributors to appear in good company and calls special attention to the anthology. It is, in fact, a marketing device that assures high quality as well. Marylin sees no reason not to republish poems by such major authors, giving the poems a chance to reach a new audience. There are few writers, publishers, or other professionals in the book business who find success in several subject areas. Passionate purpose often dictates a fruitful path in a specialized niche. Such is the case with Karla Wheeler and Quality of Life Publishing Company, which is the direct outgrowth of Wheeler’s personal and professional hospice experience. Karla Wheeler grew up in Maryland, Philadelphia, and Cleveland. After marrying her Canadian husband, she moved to Southwestern Ontario in 1978 where she studied journalism and became a newspaper reporter and editor, the founding editor of a monthly business magazine, and editor of a bi-monthly lifestyle magazine. Having enjoyed visits to relatives in Naples, she and her husband decided to move here in 1989 to be near her parents. Wheeler sought a low profile career after being too much in the public eye as a highly visible journalist, and she found one as contract editor for several medical magazines: Cardiology World News, Geriatric Consultant, Contemporary SeniorHealth, and Physicians’ Assets. These experiences taught her how to research clinical material. Wheeler has been a hospice volunteer for seventeen years, ever since her grandmother’s death following six months of hospice care, a process with which Wheeler was intimately involved and by which she was greatly inspired. When her father died in 1998 after having received hospice care for only seven days, Wheeler founded the outreach newsletter Quality of Life Matters. Even at the time of her grandmother’s death, Wheeler had recognized the need to help medical professionals lead the families of terminally ill patients to the hospice philosophy. Following her father’s death, she dedicated her career to easing the way for dying patients and their families through her own writing and by leading the editorial team at Quality of Life Publishing (QofL), begun in 1999. The Quality of Life Matters newsletter, which supports the educational missions of the hospice and bereavement community, can be customized for hospices to distribute as their own educational service. For example, the newsletter masthead might read, as one does: “Provided as an educational service by Premier Hospice.” The customized version can include contact information for the particular hospice that is making the newsletter available, as this one does for Premier Hospice’s facilities in three states. This quarterly publication now has a print run of 75,000 copies. Recently, QofL began a Canadian edition. Quality of Life is also a book publisher. Several of the books on the QofL list are by Wheeler. They include the very first book, Afterglow: Signs of Continued Love, published in 2002. This title was an outgrowth of a grief support column she wrote for the Scripps Howard News Service. Wheeler has created several follow-up pamphlets in the “Afterglow” series. She has also written Heart-Shaped Pickles and Timmy’s Christmas Surprise, both aimed at helping children work through the bereavement process, the latter focused on adjusting to the loss of a pet. Naples resident Richard Ballo’s Life Without Lisa tells the author’s story of being widowed with small children to raise. Surprised by the rapid advances of his wife’s cancer, Ballo was unprepared to deal with her decline and death. Fortunately, hospice services were able to provide him and his children with grief support classes, which were enormously helpful. By being brave and generous enough to share his experiences, he in turn has been helpful to others. The power of Ballo’s narrative was recognized by the Florida Publishers Association when it received a special award last month at the FPA’s Ed-U-Conference. Here to There, Grief to Peace, written and illustrated by Diana Jacks, Ph.D., traces a nine-step process from despair to reconciliation, giving necessary encouragement along the way. A useful tool for professional counselors, it is accessible for any reader. Dianne Durante’s Everyday Symbols for Joyful Living and Sandy Wiltshire’s My Gift of Light are focused on inspiration and hope. The latter is a personal narrative of psychic connection with the departed. Penny Bear’s Gift of Love, by Penny Wigglesworth, is another title – like Wheeler’s own – aimed at young readers contending with the grieving process. QofL distributes, but did not publish, Maryann Schact’s A Caregiver’s Challenge, a book designed to walk caregivers through the frustrations and challenges that they must inevitably face. It blends the author’s own experience in that role with her professional experience as a psychotherapist. These titles are designed to be of use to hospices, hospitals, churches, schools, funeral homes, and other outreach organizations, and for many such organizations special prices are available. However, as should be obvious, we all know people, including ourselves, who can benefit from the advice and solace found in such publications. As Wheeler reminded me when I visited her Naples office, one out of every one person dies! And for every death and lingering decline, there are many caregivers, loved ones, and mourners who need help. By publishing books that are timeless in their concerns and application, Wheeler worries less than other publishers do about obsolescence and short shelf life. 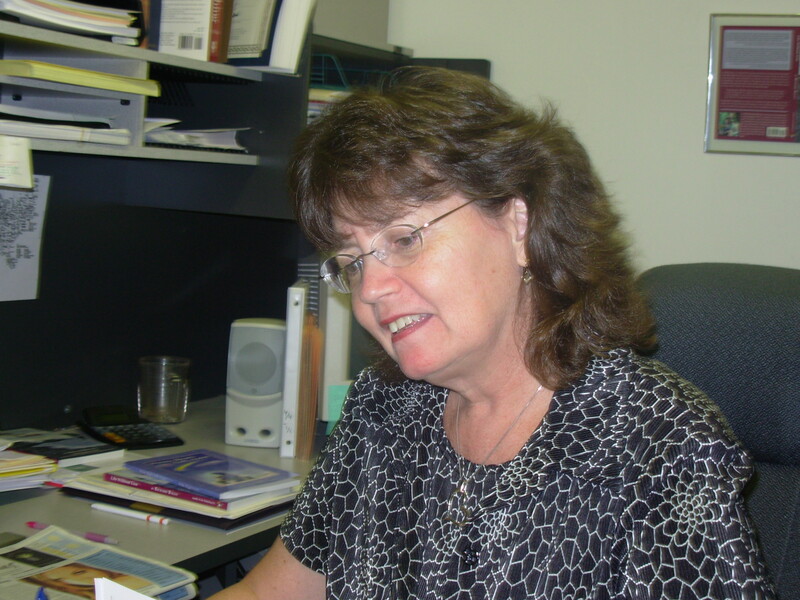 Karla Wheeler is also editor of the Florida Publishers Association’s monthly publication, FPA Sell More Books!Newsletter. In this role, she helps the many publishers in our state share information and advice on marketing, order fulfillment, and other areas of mutual concern. Find out more about this successful niche publisher at qolpublishing.com.